The summer internship program of the S.C. Department of Natural Resources' Wildlife and Freshwater Fisheries Division, geared to train the next generation of wildlife biologists and technicians and give them "real world" experience, has wound down for this year as students begin fall classes. "Years ago, when several waves of veteran wildlife biologists retired at once, we started thinking that the rest of us would retire someday, and that we needed an internship program so that we could help mold the natural resource professionals who would take our place," said Emily Cope, deputy director for wildlife and freshwater fisheries with the S.C. Department of Natural Resources (DNR). "The internship experience not only provides training and on-the-ground experience to students, but we also get a lot of work out of them." The internship program hires students from different schools around the state. This summer, 10 students from Clemson, Horry-Georgetown Tech and the University of South Carolina worked 12-week internships. "Given that Clemson University is the land grant institution in South Carolina, many of our interns are Clemson students," said Cope, who was herself once a wildlife intern from Clemson. "A lot of DNR biologists are Clemson alumni, and we remember how much we benefited from our DNR mentors, whether through internships, volunteer work or the student chapter of The Wildlife Society. Internships are one of the best ways these young women and men can meet mentors and see the practical aspects of what they are learning in the classroom. We hope that when they go back to campus they will not only have new skills, and new professional contacts, but also a keen appreciation for their coursework." Student interns' responsibilities ranged from field work such as prescribed burning, invasive plant control and other habitat management, to planting dove fields, surveys of mourning dove, black bear and bat populations and boundary-line marking. Some interns also got exposure to administrative work such as policy, planning, and public relations. Daniel Jones, a junior at Clemson University from Gaston, worked this summer on the DNR's Pee Dee Region Heritage Preserves. "My internship has been informative, inspiring and life-changing," Jones said. "I have seen how my classes are geared to prepare me to be a professional, and gained new knowledge, skills and abilities. It was great to meet so many people who are doing what I want to do when I graduate. 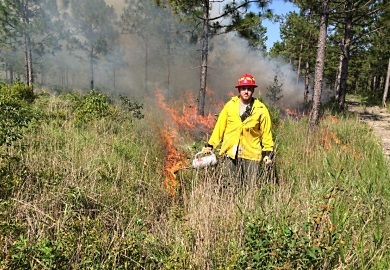 One of the most exciting thing I did was burning longleaf pine savannas. "My internship has changed the course of my life, too," Jones said. "This summer I became fascinated with the Carolina heelsplitter, an endangered freshwater mussel that is found in Flat Creek near the DNR's Forty Acre Rock Heritage Preserve. I hope to take what I have learned in my internship about this rare species and weave it into my Creative Inquiry Program on freshwater stream ecology when I get back to campus. I also aspire to earning a master's degree focused on bringing the Carolina heelsplitter back from the brink of extinction."